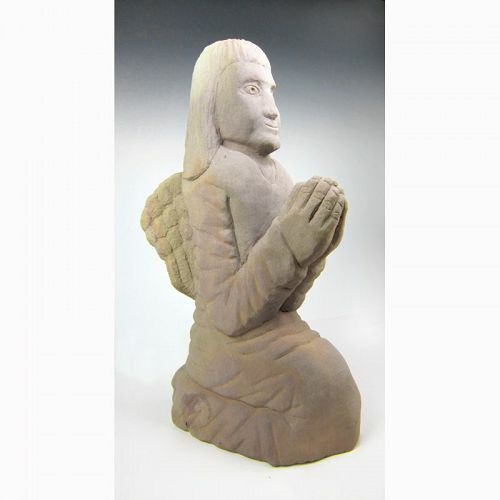 Please refer to our stock # smallangel when inquiring. This sculpture was carved in 2006 by renowned sculptor Tim Lewis. Tim is an American Stone Carver whose work is represented in the permanent collection of the Owensboro Museum of Fine Art, the Huntington Museum of Art in West Virginia, the High Museum, Atlanta, Georgia, as well as the Smithsonian American Museum in Washington, D.C. His work is also included in George H. Meyer's "American Canes: Personal Sculpture." Considered a self-taught master, his meticulous work is highly desirable by private collectors. This piece measures: 22.5" tall x 13" wide and 8.5" deep. You can now buy this painting with Art Money, a service we offer our most valued clients. Art Money will give you a 10 month, interest free loan of up to $50,000 so you can buy the art you love.